This page provides instructions on how to update the firmware for Personal Audio System SRS-X7. If the version is displayed as “2.13.2.09”, you do not need to update the firmware. Modify the issue in which the unit cannot play the file using DLNA when the tag information in this file has a string “res”. Software Update is done via internet. Please check the following steps. Note: You cannot update to the latest software if the set is NOT connected to the internet. Connect the set to the internet. 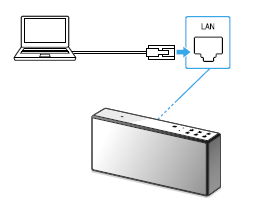 Note: When the speaker is connected a PC directly with the LAN cable for the version checking, then remove the LAN cable, and reconnect to an Access Point. When the speaker is turning power on, press buttonto turn it off. Press the button to turn the power on. 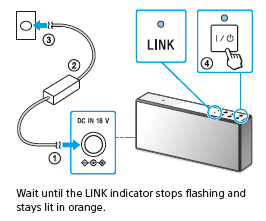 Wait until the LINK indicator stops flashing and stays lit in green or orange. Whenever a software update becomes available, the UPDATE button lights up. Note: The UPDATE button doesn't light up when software is the latest. Tap and hold the UPDATE button until beeps are heard. When the latest software update starts, the UPDATE button flashes. Note: The speaker cannot be used in normal operation while updating. The UPDATE button changes the blinking (interval and condition) by the update progress. The UPDATE button turns off and the speaker switches to standby mode or BLUETOOTH/Network standby mode automatically after updating is completed. Software update failed. Press button to turn off the speaker, then turn it on again. Make sure the speaker is connected to the internet and the UPDATE button is lit, then start updating again. Software update failed. Press button to turn off/on the speaker, then start updating again. If software update failed, the UPDATE button continues blinking slowly until turning off the speaker. Turn off the speaker after you make sure that the UPDATE button blinking has not been changed. Keep the speaker connected to the power supply and internet while updating. DO NOT remove the AC adaptor until completing the update. DO NOT power off the power during the update. Updating firmware normally takes about 3 to 10 minutes. It may take more time depending on your network environment. Please check the other document about Software Update. Connect the unit to the PC with a LAN cable (not supplied). Note: Connect the speaker to a PC directly with the LAN cable. Make sure the NETWORK OFF/ON switch on the rear of the unit is set to ON. If it was set OFF, please changes to ON. Sony Network Device Setting is displayed on your PC. The version can be found on the System Software Version in Device Details Menu.